"The real competition is with oneself, because of oneself.."
It's my pleasure to present to you our first interview at Musical Journeys. We had the privilege to talk about music with pianist Marija Gjosevska - one of the most dedicated, serious and renowned pianists from Macedonia. She has already proven her musical qualities and her unique musical sensibility. Musical Journeys thanks Marija for the interview. But first, let's introduce snippets from her rich biography to our readers. Born in 1980, Marija Gjosevska has conquered concert podiums in Macedonia, France, England, Italy, Croatia, Turkey and ex-Yugoslavia. She has performed with prestigious orchestras among which the Dubrovnik Symphonic Orchestra, Chamber Orchestra of Jeunesse Musicales Macedonia, Macedonian Philharmonic Orchestra, Festival Ohrid Summer Youth Orchestra. 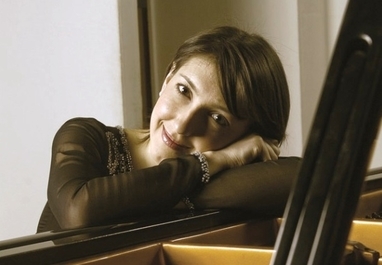 She has performed many recitals in Macedonia and Europe, and she has collaborated with many renowned conductors. Besides her solo career, Marija is a professor at the Faculty of Music Arts at the University of "Sts. Cyril and Methodius" and she has earned her Doctoral degree there as well. To break the ice, we begin with the question that might as well be as old as human existence. Dino: Marija, what is Music? ﻿Marija:﻿ Firstly, I would like to express my gratitude for the opportunity to speak about Music especially because I was asked to do it by a great musician and pianist. Music is a metaphysical dialectic of everything that ever existed, exists and will exist. Everything within the reach of the senses and beyond. Music is.. an articulated expression of movement, emotions and feelings expressed through sound and time; Nature, flora, fauna, Sun, water, air, earth.. a natural phenomenon through which a human being tries to get to know itself and its soul to the deepest layers, to get to know the outer surroundings and to experience a continous inner (spiritual) metamorphosis; A counterpoint of man’s need to excel beyond the basic needs for existence; Love..
D: What is a concert and why is the concert an important moment? M: A concert is an event during which music - like a universal energy - can influence and even change people from the inside through the performer. The sound and harmony have the power to transcend the feelings and thoughts. The performer encourages the feeling of liveliness in himself and in the listener. In such giving of one’s own life, the artist enriches another life. This sharing is pure hedonism, and the artist, as well as the listener, achieve a tremendeous feeling of pleasure, happiness and fulfilment. The concert is a capability for togetherness, a connection between the music, the performer and the audience. D: Interesting thoughts, Marija. But, can you say that Music is also a craft - given that for you it seems to be very much connected to the spiritual? M: Music is a craft in the sense of a techne-skill or knowledge. I can play, I can sing. If the sound embodies the materialization of the spirit, then the process between the one and the other is a skill or a capability. The systematization of different skills through the knowledge of sound, harmony and their position in the musical matter, brings music to the level of science. Certainly, there are two phases: a capability for music (musicality, good hearing, a sense of rhythm) and the re-production of the capability (singing, playing an instrument, composing). M: I’m attracted to the nature of sound. I prefer a sound rather than a speaking dialectic. Ever since I conciously remember my beginnings in music, I received and accepted music with understanding. The different sound constellations were very clear to me, even tough I didn’t know what harmony is. It’s a period of a very early literacy, or you can even say non-literacy. My parents always said that I was a good singer. I could find all the different melodies on the piano without knowing that the sounds have names. Simply said, the capability for music has lived in me. Another segment, but very important one, in my decision to go into music was the capability for a long-term memorization of musical composition which was discovered by my teacher at the elementary music school. I think I was in my third or fourth year when we had managed to learn with my teacher some 90 compositions (sometimes 5 in a single lesson) contrary to 10-15 compositions which a pupil that age usually learns. It was probably some sort of a sign for my parents that I have a calling to serve music. D: What's the most beautiful and the most difficult thing you had to go through with music? M: Music has a healing power and always manages to clear the soul from the positive and negative emotions. Through music we break some of our own barriers and we surpass them. D: Marija, often at your concerts the audiences are astounded from your performance, but also from the great choice of program. How do you choose the works you perform at your concerts? M: How do I choose the program for my concerts? I don’t know. Lately, intuition has become my good friend. It points to the path I should be taking. I’m happy about it, altough I’m quite aware that intuition is not activated in such a way until a person reaches enough knowledge and maturity. Exploring the rich history of piano literature, I find myself in many works from different periods and styles. But, the music of Franz Schubert is where I don’t have to search to find - it’s already who I really am. The choice of repertoire is always conditioned by our previous experience, personal taste but also momentary artistic needs. Sometimes we talk about works that are easily received and accepted, other times I love playing with the red line and offer something unusual or difficult to grasp. I try to get to know as much music as possible so I could make a fine choice for my programs. D: What is very much in the center of attention in the world of music are of course, the competitions. It seems they are an unavoidable part of the life of a young musician. Everyone has a different opinion, what is yours? M: Competitions are forums for musicians - Olympics. There’s a strong exchange of energies, philosophies, opinions.. The good thing about competition preparations is the pianist’s mobilization - to work and to prepare in a definitive time deadline - which could lead to a fast improvement. The bad side is, all the negative feelings and the thought that you have to win or please someone’s tastes or needs. You’re not obliged to do this. If competitions help someone to improve and excel oneself because of some personal feelings, it’s fine. But if it causes hatred toward someone else.. then better not. Other people can be our motivation with all the good things they’re doing, not a frustration. The real competition is with oneself, because of oneself. D: Indeed the real competition is with oneself, but how appreciated are musicians and music today? M: Music and musicians were always appreciated, and will be appreciated in the future. The problem is in the view of the world that is faced towards the material and making a business out of the spiritual, therefore the spiritual becomes a victim of the material. I have nothing against the material, as long as it helps the spiritual. That’s the powerlessness of the human as a being; the excelling over the lower passions; proof of imperfection; a confirmation for the nature of man who always seeks the opposite of what he already possesses. The trend of today’s time is fast improvement, good life without struggle, to be above everything and above everyone; but this must be followed by a catharsis. D: Marija, can you point to one special concert that has remained in your memories for something unique, for our readers? M: I can mention the concert with the following program: F. Schubert - Sonata for piano D.960 in B-major and S. Prokofiev - Sonata no.8 in B-major because of their strong cosmical dimension and its effect on us, the people. D: Recital or piano+orchestra? Any difference in your preparations for both? M: Recital. I don’t know if it is because the inability to perform with the orchestra often or because of my artistic nature. Maybe both. One develops loneliness, the other socialness. I also love chamber music in any form or combination. Musical Journeys would like to thank Marija Gjosevska for this interview. The team wishes her a wonderful future and fruitful explorations in music.